Posts with links mean you can share something you like with friends without having to create an e-mail list or call up someone to talk about it. At the same time, you’re almost more likely to get someone to strike up a conversation about your content because it’s going out to more people, and you’re reaching a greater number of people who may be interested in it. To post a link, simply follow the instructions for updating a status and copy and paste the link you want into the field where you normally type a status. This automatically expands a preview of what your post will look like, including a preview of the content. 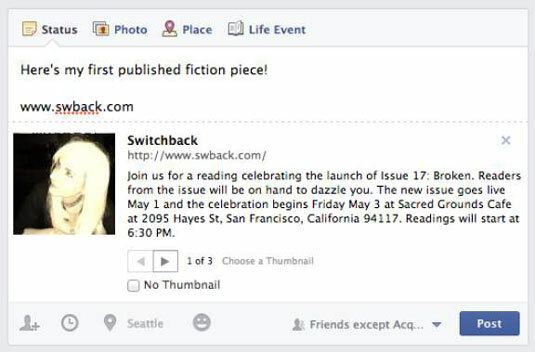 A preview usually contains a headline, a thumbnail photo, and teaser text. Hover over either the headline or teaser text and click to edit what appears in the preview. Use the arrows at the bottom of the preview to change the thumbnail that appears alongside the preview. You can also edit your own comment. If you delete the URL text from the Share box, it doesn’t actually remove the link from your post. In fact, deleting the link can make your post look cleaner and leave more room for your own thoughts about the link.